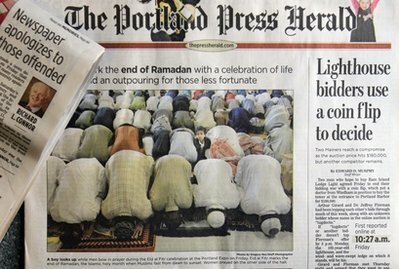 For weeks I’ve been talking about Portland Press Herald publisher and editor Richard L. Connor’s apology for covering Ramadan and then his rephrasing of that apology. Unfortunately the story gained only minimal national attention, most notably on “The Colbert Report”, and in James Poniewozik’s blog at Time Magazine (see Stephen Colbert Picks Up Apology and Poniewozik on the Press Herald). We can add the print edition of Time Magazine to that list now. 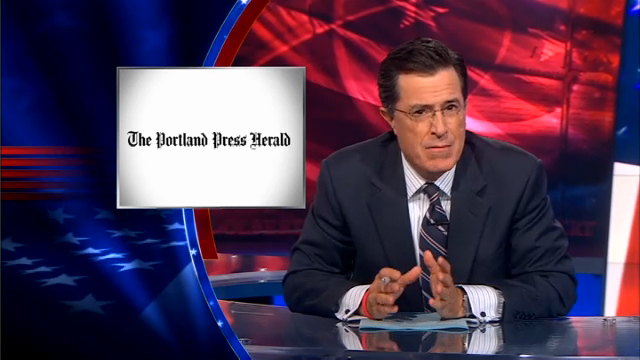 This week Poniewozik has an article about Jon Stewart’s Rally to Restore Sanity and Colbert’s competing March to Keep Fear Alive, and he uses the Press Herald apology to illustrate the media’s fright of that fringe element, the loud 15 Percenters. The very idea that in the U.S. today you have to hold a protest to promote rational discourse is absurd. It’s funny because it’s true. Poniewozik has become one of my favorite writers in the young generation of Time Magazine writers, I’m glad he’s picked up this story. Anyway, I think we’re nearing the end of the cycle for the apology story. While I would have liked a few more headlines, maybe a march on the Press Herald’s offices in One City Center or Richard L. Connor as Keith Olbermann’s “Worst Person in the World”, the coverage that the story did receive was quality. So I wrote to Keith Olbermann, Rachel Maddow and Jon Stewart after Richard L. Connor’s apology for Ramadan coverage on September 11th. After a week of not seeing anything, I gave up hope. 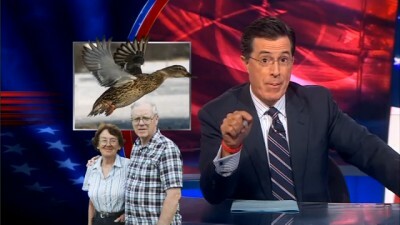 And then Stephen Colbert talked about it on “The Colbert Report” on Monday! I have to mention this (a few days late). Portland Press Herald editor and publisher, Richard L. Connor, has written another article about his apology for the Ramadan coverage on September 11th. I meant to apologize for what we did not print — front-page coverage of 9/11 on the anniversary of a day that stirs deep and unhealed wounds. I was in no way apologizing for what we did print in a deservedly prominent position — a striking photo of our local Muslim community in prayer. This is good, but why did it take a week to recant the apology, Connor? Interesting how it took Richard L. Connor mere hours to apologize for Saturday’s story, but it takes the editorial board damn near a week to publish Letters to the Editor about it. Also, I think this title, like so much about the story, focuses on the wrong theme; the disgust that many of us had was not about the Eid holiday or the September 11th anniversary but how the newspaper leadership apologized for running a news story. Please also note, he used “kowtowing” – the same verb I used! I’m not letting this die until Jon Stewart is poking fun of the Press Herald or Keith Olbermann lists Richard Connor as a “Worst Person in the World”. The Associated Press picked up the Apologygate story yesterday morning, but it was brief and easily missable. 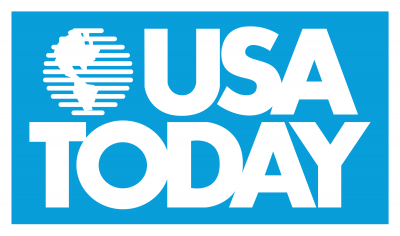 USA Today (“America’s colorful news”) picked it up, however, and gave it a fantastic title: “Maine editor apologizes to readers for Ramadan story on 9/11“. I belong to that increasing population of people, mostly under the age of 40, who get most of their news from the internet. During the week I don’t buy a daily paper, save for the free Forecaster and Portland Daily Sun. 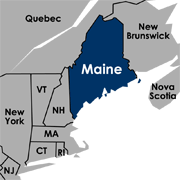 I do subscribe to the weekly Bridgton News to get local hometown stories, however, and on the weekend, we routinely get the Maine Sunday Telegram. Yesterday morning I was reading the Portland Press Herald online and was pleased to see such a nice article about Eid ul-Fitr in Portland: “A show of faith and forgiveness“. We went about our day, got home at night and saw this linked-to on Facebook: “Newspaper apologizes to those offended“. Are you f@#king kidding me? The crazies are taking over the show. The people who comment on the website are running the editorial direction of the paper. I’m done with the Portland Press Herald. I’m done with the Maine Sunday Telegram. If any of you are offended by this direction the paper is taking, please take five minutes to send a Letter to the Editor to let them know how you feel.